Waiting for Superman. Riveting. Real. Raw. “I really also enjoyed the movie. I did get teary eyed because I know where my son has been and I know where he is about to go. The movie made me feel really blessed to have my son in a school that is making a difference in the minority community. 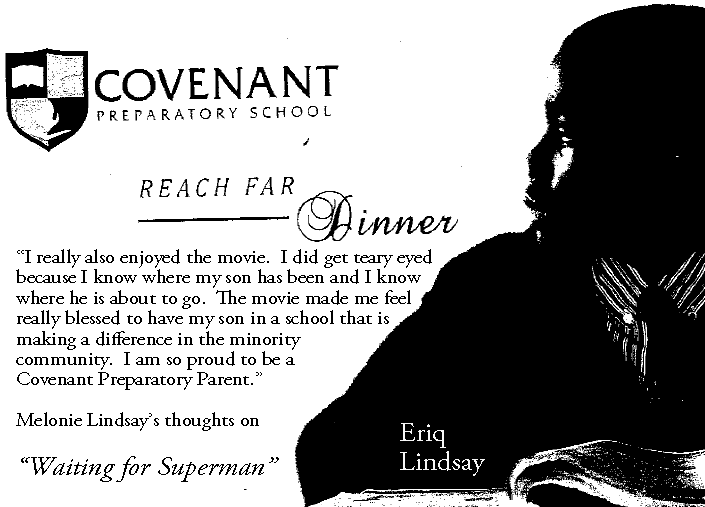 I am so proud to be a Covenant Preparatory Parent. Anyone who drives through Hartford regularly might recognize something of themselves in the much-hyped documentary, “Waiting for Superman,” opening in Connecticut today. The movie begins with Davis Guggenheim — the liberal-minded director of “An Inconvenient Truth” — talking about how he feels guilty when he drives by struggling Los Angeles public schools as he takes his children to their exclusive private school each morning. The last word: Go See The Movie!